Owojela’s Blog www.owojelasblog.com was founded on the 4th of October 2015 by Owojela Odey who was on a quest to give people reliable information they would trust and today we have worked based on this vision for three solid years. With all gratitude, the Owojela's Blog team thanks God for a successful journey throughout the three solid years of active blogging. We also use this medium to appreciate our highly esteemed audience and fans who gave us a reason to always hit the publish button. We appreciate our publisher partners, business partners and clients who have worked with us in these three years. As we begin a new journey, we promise to serve you better. 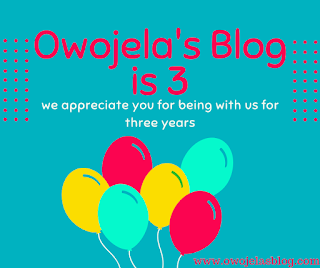 Happy 3 years blogging anniversary to owojela's Blog www.owojelasblog.com!